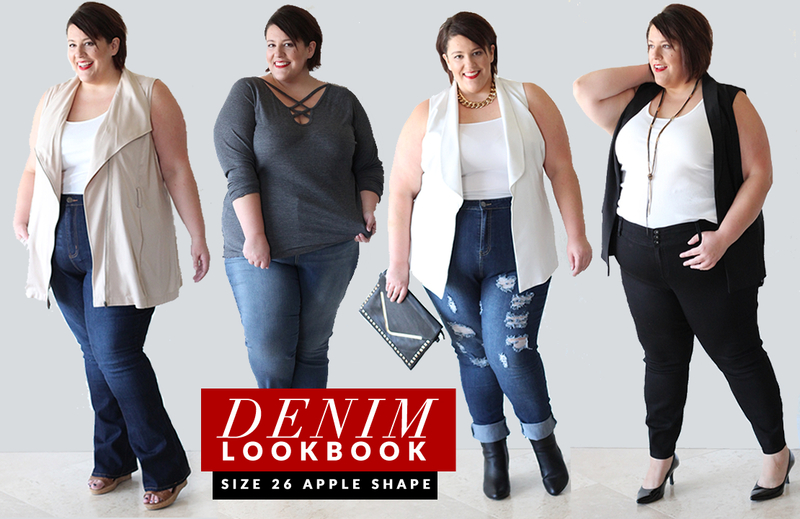 The absolutely BEST black jegging/denim is from 6th & Lane at Lane Bryant. These jeans are literally magic and not only have lots of stretch, but actually keep their shape all damn day. I have no idea what witchcraft it took to make these babies possible, but thank you to the people at Lane Bryant for providing some of the best quality denim you can find for plus size women. These jeans are sold out online, but I bet you can still find them in the stores. But, here are some similar styles that I vouch for! I love tucking in my shirts and adding an "over thing" like this vest from Lane Bryant. Here are some of my favorite vests and open blazers: here, here, and here. This white vest was a gift from my blogger friend Parker of Parker Style and it's from Alfani. The closest thing I could find was this open vest. There's a reason I have 4 pairs of this jegging! This skinny jegging from Torrid in the light wash (link). I paired with one of my fav activewear tops from Rainbeau Curves - annnnnddddd wore it backwards because I can and I like it :). It's the Emilia Long Sleeve - Dark Heather Grey $34.95 in sizes 14-28 (link).